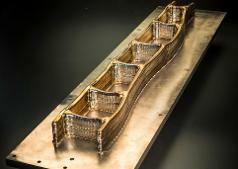 One of the largest 3D metal parts in the UK has now been produced as a result of the research. Designed by BAE Systems engineers, the part measures 1.2m in length and is made of titanium. Known as a spar section, the part forms a main structural element of the aircraft wing structure and took just 37 hours to build from a digital model, where previously this process would have taken weeks. The manufacture of the part used a specific kind of 3D printing known as Wire+Arc Additive Manufacture (WAAM).